B+B SmartWorx powered by Advantech has announced a new addition to its Wzzard wireless sensing technology starter kits—the Wzzard HVAC/Compressor Monitoring Starter Kit. The Wzzard HVAC kit provides a non-intrusive, easily-installed solution for monitoring current and differential temperature on equipment without disrupting existing operations. 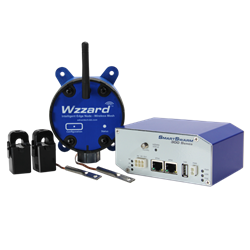 "Wzzard sensing solution starter kits are a great way to test your system, and help prove your business case of data monitoring." Cooling systems are often “teamed” with many cooling units working in tandem. In many cases, there are no management systems in place, which can make it impossible to detect performance problems until several units fail. The Wzzard HVAC/Compressor Monitoring Starter Kit makes it easy to see the run time, duty cycle and output effectiveness of each unit, allowing users to maximize uptime and eliminate problems before they cause failures impacting the bottom line. The Wzzard HVAC Monitoring Kit joins the previously-released Wzzard Energy Monitoring Starter Kit. To learn more about Wzzard, visit http://advantech-bb.com/product-technology/iot-and-network-edge-platforms/wireless-sensing-solutions/. Founded in 1981, B+B SmartWorx (formerly B&B Electronics) designs and manufactures intelligent M2M and IoT connectivity solutions for wireless and wired networks. Specializing in intelligent connectivity at the “edge” of networks in remote and demanding environments, the company’s product solutions use Ethernet, serial, wireless, cellular and USB communication technologies. In 2016 B+B SmartWorx became part of Advantech, global provider of trusted and innovative products, services and solutions in industrial automation and embedded computing across diverse industries and applications. Together, Advantech and B+B SmartWorx work to enable an intelligent planet. B+B SmartWorx is headquartered in Ottawa, Ill., USA, with EMEA operations based in Galway, Ireland, and the Czech Republic. Additional engineering locations are based in California. To learn more, visit us at http://www.advantech-bb.com.